Select the Shipping Method you prefer. Depending on your shipping destination, you may have different choices here. This also provides a detailed summary of the total charge for the order including all fees and taxes in the currency specified. The prices for each shipping method are listed and the currency for those prices is specified at the bottom of the dialog. Any applicable taxes for your selected territory will be listed in the specified currency. 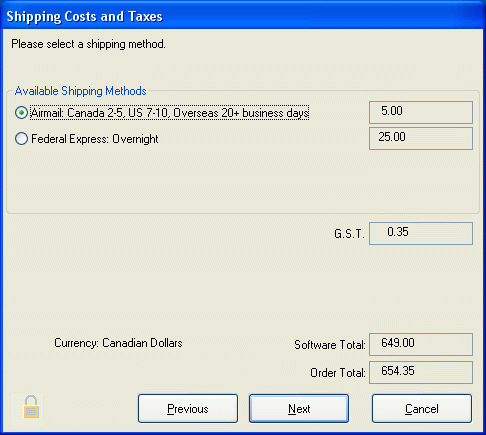 On the screenshot above, Canadian GST applies to the shipping charges for the purchase. If there are no taxes that Aurora Systems is responsible for collecting, this area will not be visible. This is the total price of the products you have selected to purchase in the specified currency. Press this button to confirm your selection and move to the next step.